But the leading indicators are mixed, says Gavin R. Putland. 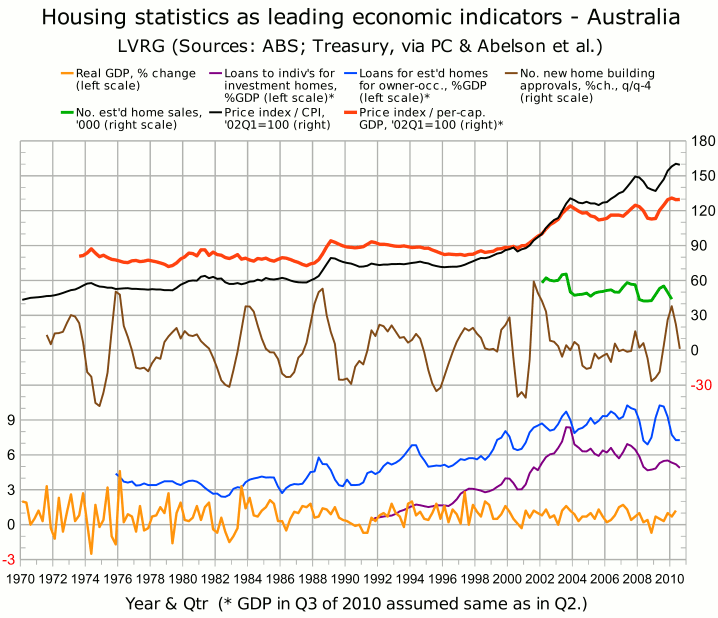 The average Australian housing investor is negatively geared. That is, the interest cost incurred by the average investor is not justified by rental income alone, but depends on capital gains as well. The “average” is taken over all investors, including those who own their properties outright and/or bought their properties for far less than their current values. Anyone contemplating paying current prices will need faster capital gains than the average investor. Unfortunately for the prospective sellers, and especially for recent buyers, those capital gains have stopped. Take a bow, Mr Joye. Now tell me: when buyers, who cannot justify the interest on current prices unless those prices are rising, see that prices have merely flat-lined in the second half of 2010, will they pay the same prices in 2011? The second half of 2010 is looking much like the first half of 2008, isn't it? 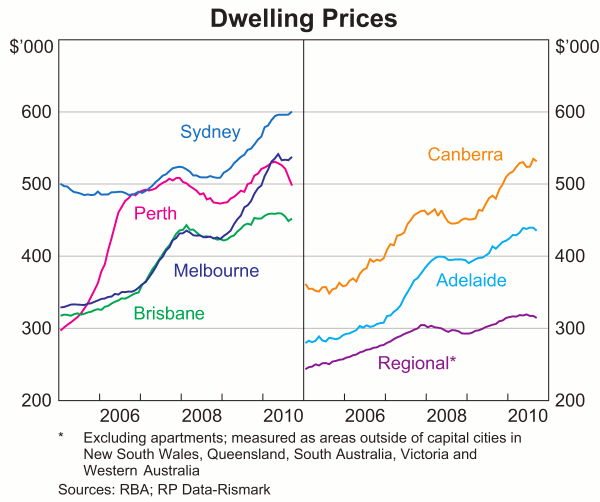 Except in Perth, where prices are falling faster. After the 2008 slump, it took the First Home Owners' Boost and a 425-point cut in interest rates to turn the market around. Now that the effect of those measures has been shown to be temporary, buyers won't so easily fall for the same trick again. Besides, this time the RBA won't have so much room to cut rates — not least because it will be acting alone, and not in concert with foreign central banks. What then is to be done? I have suggested abolishing the GST in order to increase capacity to service loans, and replacing the revenue by extending capital gains tax to all assets at the full marginal rate, with no exemptions and no grandfathering. The latter step, by reducing the attractiveness of capital gains relative to current income, would tend to prevent a new speculative bubble. But it would not cause a one-off fall in prices, because the discouragement of buying (caused by the future CGT liability) would be offset by a discouragement of selling (due to realization of the current CGT liability). From the viewpoint of current owners — and their creditors — it's better to pay tax on a capital gain than to make a capital loss. 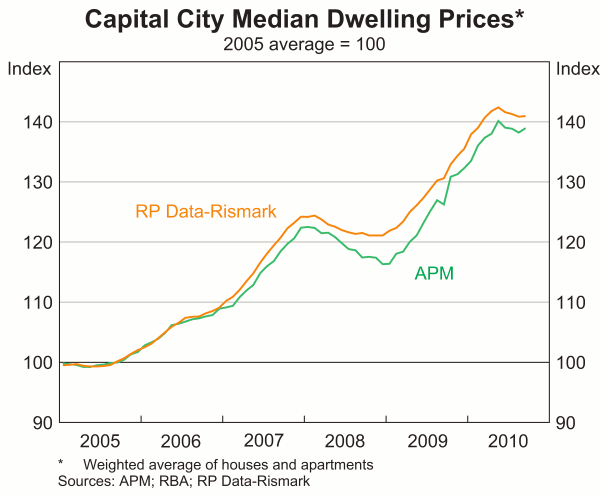 The monthly price indices from RP Data-Rismark and APM were confirmed by the ABS's quarterly index, which is used in the following graph [1,2], in which the red curve (the “scaled index”) shows a composite index of home prices scaled to per-capita GDP, while the black curve (the “real index”) shows the same composite index adjusted for the CPI only. As announced last month, the scaled index yields an estimate of the overvaluation. The scaled index was almost stable from 1992 to 1994, when official interest rates were similar to today's, but is now about 45% above the “almost stable” level; that is, it must fall about 30% to return to that level. In the above graph, the purple curve (second from bottom) shows lending to individuals for acquisition of investment homes (seasonally adjusted, aggregated quarterly, and divided by GDP), and the blue curve (third from bottom) shows lending for acquisition of established homes for owner-occupation (similarly processed). Clear downturns in both curves began in 1994, early 2000, late 2003 and late 2007, and each occasion gave at least one quarter's warning of a price decline. In 2002, lending for owner-occupation (blue) fell substantially due to the phase-out of the $7000 Commonwealth Additional Grant (CAG), which was introduced in March 2001, reduced to $3000 at the end of 2001, and withdrawn at the end of June 2002. Lending for investment (purple) perhaps plateaued briefly, but did not fall. Prices kept rising, because the withdrawal of the grant and the consequent fall in sales were anticipated and “priced in”. In late 2009, it seemed at first that a similar scenario was unfolding due to the phase-out of the FHOB (introduced in October 2008, halved at the end of September 2009, and terminated at the end of that year). But the latest figures show that the purple (investment) curve turned down, before prices peaked and lending for owner-occupation tentatively recovered from the post-FHOB slump. One possible explanation for the seemingly anomalous peaking of prices is that after so many bubble-bursts in so many countries, property owners have decided to get out while the getting is good. That would be consistent with the sudden talk of a “glut” and the associated story about far more “For Sale” signs being put up than taken down.